As your criminal defense lawyer in Statesville, NC, I will aggressively fight for you to ensure your best interests are protected. Facing the penalties associated with committing a criminal offense can be intimidating and overwhelming. If you need assistance defending yourself in court, I am here to help. As your criminal defense lawyer, I will aggressively fight for you to ensure your best interests are protected. Knowledge of the legal system – The legal system, particularly pertaining to criminal law, can be confusing. I will be there every step of the way to provide guidance and to ensure you know what solutions are available to you. The potential for a reduced penalty – In some cases, working with a criminal defense lawyer may result in the penalties you face being reduced or your case being dismissed altogether. Damage control – If you spoke with the police during the arrest process, they may have obtained information from you that could be damaging to your case. I will make sure that this information does not harm the outcome of your case in a court of law. Whether you were arrested for driving under the influence of alcohol, assaulting another person, possessing drugs, or violating the terms of your probation, I am here to help. For more information about the different types of criminal law cases that I handle in the Statesville, North Carolina area, contact me, W. Sloan Goforth, Attorney at Law, today. 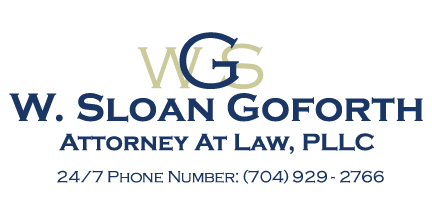 At the office of W. Sloan Goforth, Attorney at Law, our criminal defense lawyer proudly serves residents of Statesville, Troutman, Taylorsville, Mocksville, Mooresville, Hickory, Iredell County, Alexander County, and Davie County, North Carolina.